The Mar Vista Neighborhood of Aptos is centered along Soquel Avenue, roughly between Park Avenue and State Park Drive. Most of it was originally part of the Rancho Aptos land grant, given to Rafael Castro by the governor of Mexico in 1833. Rafael Castro remains buried in the Resurrection Church cemetery along Soquel Drive. The area is largely residential, with few shops and services located within its borders. The neighborhood is mostly known for Cabrillo College and Mar Vista Elementary School. The Aptos La Selva Fire Station is located here too. The only shopping center is Aptos Center, which contains a number of popular shops, services, and restaurants. The Rancho del Mar Shopping Center is much larger and located just past the boundary of the Mar Vista neighborhood. Most homes in the area are single family detached structures built in the late 1950’s through the early 1970’s. There are number of condominiums too, and a couple of mobile home parks can be found here as well. The old Par 3 golf course – now unused – is also located within the boundaries of the neighborhood. 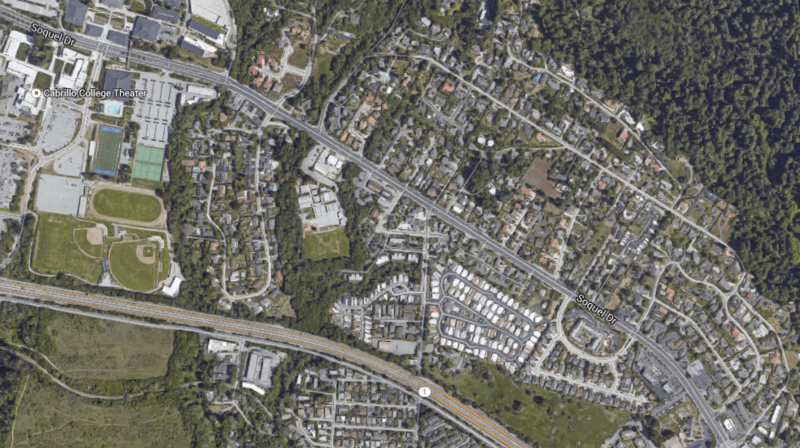 Plans are afoot to reconnect the neighborhood with the Seacliff neighborhood on the other side of Highway 1. A pedestrian and bicycle over-crossing is slated to be built in 2017.